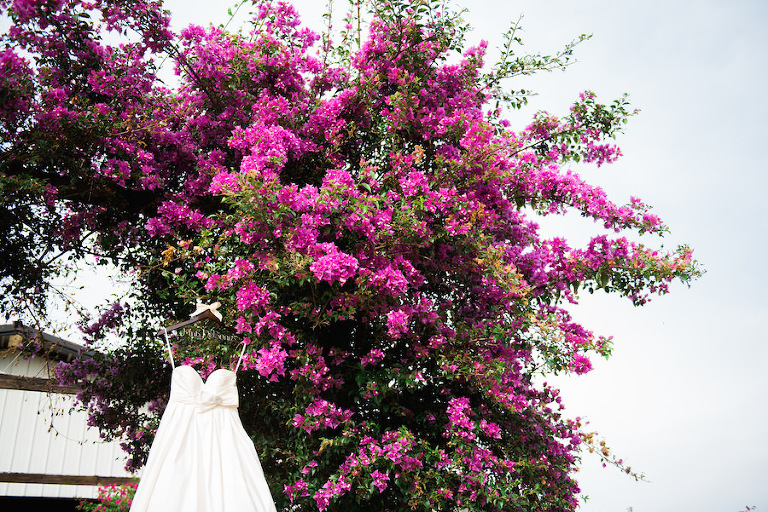 Megan and Domenic’s vintage Dade City wedding incorporated the bride’s southern heritage. Food, in particular dessert, was an important part of the Land O’ Lakes couple’s outdoor barn wedding. One of the bride’s most cherished moments included the “first touch” with her soon-to-be groom, as photographed by Dade City wedding photographer Kera Photography. To enhance her natural beauty, Megan hired Dade City makeup artist Michele Renee The Studio. 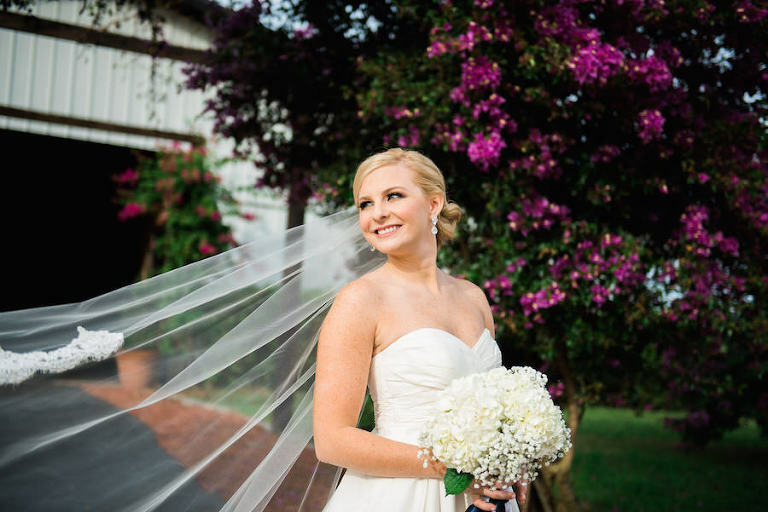 “I do not wear very much makeup on a daily basis, and I wanted to look stunning, but not overdone,” the bride explained. “I spoke with Michele Renee The Studio, and they chose my artist based on the amount of makeup and type of makeup style I wanted, feminine and elegant. I hit it off immediately with my artist, Caroline. Everyone was professional and top-notch. It all turned out perfectly. Looking back, one of Megan’s most memorable moments included her wedding vows. “The vows will forever be our favorite part of the day. Truly, that was an otherworldly experience knowing that we were giving ourselves to each other, in front of God and our closest family and friends,” the bride reminisced. What was your makeup inspiration and what did you look for in a makeup artist? I do not wear very much makeup on a daily basis, and I wanted to look stunning, but not overdone. I spoke with Michele Renee The Studio, and they chose my artist based on the amount of makeup and type of makeup style I wanted, feminine and elegant. I hit it off immediately with my artist, Caroline. Everyone was professional and top-notch. It all turned out perfectly. I wanted natural photos that would be timeless. I didn’t want everything to be posed. Kera of Kera Photography is a wonderful person. I have had the privilege to watch her grow her photography business from the ground up. Her determination and unwavering ability to bring out the best in her photography subjects, all while making them feel special, was a huge selling point for me. She truly has a heart for people, and it shows in her work. I knew her style was perfect for what I had in mind. I trusted her and knew I would be comfortable working closely with her on a day so important to us. When I was living in St. Pete, Domenic and I frequented Beach Drive weekly. We love the atmosphere there so much. On the morning of the proposal, he had breakfast made for me and treated me to a mani/pedi because I had been traveling for work. At the nail salon, there was a card instructing me to meet him and our French Bulldog, Henry, on Beach Drive for lunch. As I was walking, I saw him at the pavilion on the waterfront. When he saw me, he got down on one knee. I honestly do not remember what he said or what I said, I just remember being happier than I’d ever been! Our wedding theme was vintage/southern, shabby chic. I love my humble, southern roots. My ideal décor had a vintage look with a touch of feminine delicacy. I really wanted to let the farm’s natural beauty shine through without extensive décor. We kept everything simple. It was important to us that people could have a good time and not feel too buttoned-up. Blush, champagne, navy and gold. I chose those colors because they lend themselves to the natural landscape at the farm. Decide with your fiancé what the most important parts of your wedding are and then invest in those. Do not feel as though you have to spend the most money to have the best wedding. My dress was on clearance for $199, and I made alterations to make it my dream gown! Hire an event planner. This is an expense that will pay for itself when everyone becomes an “expert” the week before your wedding. Having been an event planner, I can tell you the value in having one present.